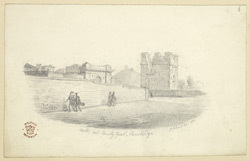 This pencil drawing depicts the remains of the Norman Castle and the County Gaol. The University at Cambridge emerged with the founding of its first college, Peterhouse, in 1209. A number of magnificent colleges followed, such as Trinity in 1317, King's in 1440 and St John's in 1511. The future Lord Protector, Oliver Cromwell, was educated at Sidney Sussex College and later became MP for Cambridge in 1640. Cromwell utilised the site of the County Gaol, illustrated here, as the headquarters for his "Eastern Counties Association". Although the University saw little expansion between 1594 and 1800, new colleges emerged in the 19th century, including those specifically for women. The city saw the rise of many notable individuals, such as the scientists Isaac Newton, Charles Darwin and Ernest Rutherford.